In a child's world, every problem is a big deal to which they respond with big emotions. 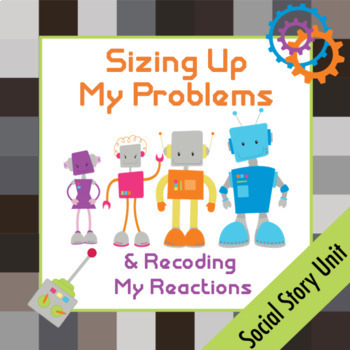 In this social story, cute robots teach children to size up their problems then react appropriately. Kids will be exposed to 100+ everyday situations. They will learn critical thinking, positive thinking, and self-regulating as they analyze each situation. Dropping a pencil and breaking a leg do not merit the same reaction, but if we don't help kids learn perspective they will react to everything as if it is a big problem. Instructional story – Print, insert into sleeve protectors, and keep in a 3-ring binder. Use comb binding for a thinner book. Share with teachers, counselors, parents, babysitters, coaches, etc. so everyone knows what strategies you are working on. 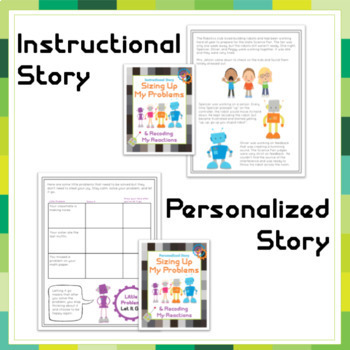 Personalized story - To avoid fatigue, we recommend that you introduce this story after the child has had a break but within 24 hours of the instructional story. Allow time for the student to pause, process, and record their thoughts and feelings. If writing is a challenge, consider providing a scribe. 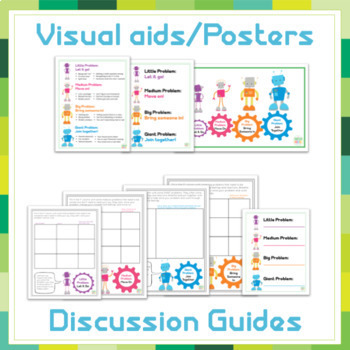 Discussion guides – After reading both stories, use the discussion guides as discussion guides in which an adult moderator acts as the scribe allowing the child can focus on processing their thoughts. These guides can also be used as worksheets to practice analytical thinking or in a "cool down" zone to practice self-regulation. These can be helpful in data collection for IEP or BIP goals. Activity - For longevity, print in color and laminate or print in color on card stock. 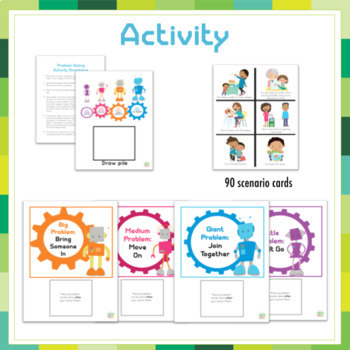 This activity can be used one-on-one or in a small group setting. To maximize the effectiveness of the game and keep student interest, we recommend that you only use up to 45 cards in one sitting. NOTE: Use your discretion with these cards as some of the HUGE problems include topics such as death, divorce, critical illness, and abuse. Since the size of the problem can vary depending on context, these problem cards are meant to generate discussion. If a child says something that leads you to believe they may be in danger, please follow your state mandated reporting procedures. → Social Story Unit: Use Self-control, S.T.O.P. Check out our other behavior management tools and social stories.